Burning up energy and adrenalin may be what Queenstown is most famous for, but look outside the square and you’ll discover a fresh undercurrent of fine dining, world-class sculpture and fabrics, and some of the world’s best cool-climate wines. The hills and dales around Queenstown are populated with large, healthy herds of merino and Suffolk sheep, as well as Angus, Charolais and Hereford cattle, while the clear waters of Lake Wakatipu are teeming with brown and rainbow trout and three types of salmon. All of which combines to inspire a handful of restaurants that are carving out an individual, exciting style of Kiwi dining. Combined with an adolescent wine industry that is winning recognition for its clean-tasting, mineral-tangy wines, and Queenstown has great allure for a new breed of visitors. The hills beyond Queenstown are rich in greenstone, which drew the first Maori settlers to the area more than 800 years ago. While the stone is no longer used for weaponry – Captain Cook described it as holding a keener edge than metal – it is inspiring local jewellers. One jeweller well known across the Tasman is Sir Michael Hill. His son, Mark, has inherited his parents’ creative talents and applied them to his chosen field of sculpture. Many of his fine, large-scale pieces are dotted across the The Hills – his family’s 101-hectare estate at nearby Arrowtown, a beautifully preserved 1860s mining town that is worth a visit in its own right. The Hills is an example of what happens when passion, creativity and large wads of cash collide, starting with a request to golf course architect John Darby to create one hole on land adjoining the Hill family home. The project grew and opened as a full 18-hole course in 2007. It is regarded by many as the best in the area, and hosts the New Zealand PGA tournament. Membership is limited to 100, but visitors can apply to play – at a price ($NZ500, or about $A400). Australians can lay some claim to the emergence of the amazing Merinosilk – a blend of 70 per cent merino wool, 10 per cent silk and 20 per cent possum fur, of all things. The result is a luxurious, lightweight fabric that is being dyed and used to stunning effect. The cost of the end products can be fairly stunning, too, but you won’t find anything like it anywhere else in the world. Jane Canaway travelled courtesy of Air New Zealand and was a guest of Matakauri Lodge and Dart River Jet Safaris. Gentlemen are required to wear a jacket for dinner at the magnificent Matakauri Lodge, an intimate cluster of just 11 luxurious private rooms dotted among landscaped gardens in a private section of the Lake Wakatipu shoreline, about 10 kilometres south-east of Queenstown. It is worth the effort – equally impressive as the lodge’s setting is the food, which stands head and shoulders above most other dining options in Queenstown. At dinner, guests are greeted with complimentary cocktails and canapés. There is a choice of splendid spots from which to enjoy the views – by the outdoor fireplace, on the deck, in the lounge with its huge picture windows, or the smaller dining room. Honeymooners can opt to dine in their suites, or even have a private table made up in the residents’ library upstairs. And every night the chefs – many of them young guns from overseas touring the world as part of their global experience and bringing the freshest trends from all corners of the world – present a brand-new tasting menu as well as a la carte options, combining the best of whatever local farmers and suppliers have in season. Fish will often feature, whether it is tuna, monkfish or blue nose, as will the most delicate lamb and Angus beef, all presented in a variety of imaginative ways and accompanied by the best vegetables and herbs from the lodge’s own garden. How about seared South Island monkfish in a tomato, fennel, kalamata olive and thyme velouté; roasted scallops with parsnip, cos, sugar snap pea and vanilla-white wine sauce; or breast of corn-fed chicken with caramelised onion, baby turnip, asparagus and chicken consommé? Set as the lodge is, so close to Central Otago and its renowned vineyards, guests are invited to choose from a range of top local wines – including lots of pinot gris, pinot noir, syrah, chardonnay and sauvignon blanc. Suffice to say the suites are first class, beautifully redecorated two years ago in a palette of stone, timber, fresh white and earthy tones, and offering lake views from virtually every corner of every room. Spa-studded luxury: Winter at Matakauri Lodge … and the outdoor Jacuzzi and pool. Guests are also welcome to use the gym, spa or infinity pool (naturally with Those Views across the lake to the ski fields of the Remarkables mountain ranges), or to take advantage of some of the spa treatments available. With the exception of wines and spirits, guests can help themselves to the complimentary goodies in their mini-bars, such as beer, soft drinks, yummy local chocolate and snacks, including freshly made cookies from the lodge kitchen. If you can tear yourself away from the lodge, you can sign up for a range of activities, such as a day out painting with a local artist, a round of golf, a ride on the lodge’s mountain bikes or a wine-tasting tour. The lodge offers a level of luxury and personal service rarely found anywhere in the world and, with such spectacular scenery as its backdrop, it is simply one of the most special experiences available. It is unlikely there are any Tolkien fans who are not aware The Lord of the Rings trilogy was filmed in New Zealand. And anyone who has seen the film versions is likely to feel an instant thrill of recognition when they see the mountains and lakes around Queenstown. Isengard, Lothlorien, Dimrill Dale and Argonath are all here, and can be visited in a number of ways. A jet-boat trip with Dart River Jet Safaris will take you into the heart of Isengard – a lovely valley that has also doubled as the Swiss Alps (in a Milka chocolate advert), the Rocky Mountains (for Coors light beer), the Himalayas (in Vertical Limit), Narnia in the film adaptations of the C.S. Lewis’ books and locations for many other films. Tours cost $NZ219 (about $A170) and include a guided visit to the ancient Nothofagus forest at Mount Aspiring National Park and a 4WD safari on which you see the site of Gandalf’s ride to Isengard, where Boromir is struck down, and where Aragon fights the orcs. Or you can opt to jet boat up and kayak downstream past the site of the three pillars at Argonath for $NZ299 (about $A230) – although the pillars were digitally added afterwards, of course. for photos. Full-day tours cost NZ$299 by road; an air/road version costs $NZ1650 (about $A1300). Heliworks includes several LOTR landing sites with a flight to Milford Sound in a 3½-hour extravaganza that costs $NZ1800 (about $A1400). Nomad Safaris offers two different half-day tours of various sites, both costing $NZ169 (about $A130). Dart Stables leads a number of LOTR horse treks of varying lengths and difficulty from $NZ135 (children $NZ125) up to $NZ315. Or you can buy a book, hire a car and do it all yourself. Whatever transport you choose, make time to see the millennium-old trees in the Mount Aspiring National Park – some of these trees were alive when humans first set set foot in the area. Initially, this may have been influenced by the young, active, hungry demographics of many visitors with huge appetites and low budgets, but it’s continued because the burgers are consistently good. The place is easy to find – it’s the one with the long queue outside around meal times because demand is high and everything is made to order – but you can order ahead. Prices range from $NZ10 to $NZ18.50 for a 200-gram ribeye steak but the most challenging meal is a Big Al ($NZ17.50), comprising a half-pound of meat, bacon, cheese, two eggs, beetroot, lettuce, tomato, red onion, relish and Ferg’s world-famous aioli. Open 21 hours a day. Set in a cute stone cottage with lovely lake views, this stylish restaurant is one of a handful setting new standards for fine dining in Queenstown. Only four years old, it has been a finalist in the Cuisine Restaurant of the Year awards for the past three years. 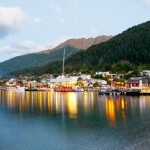 It is part of the Good Group that includes stylish Queenstown wine bars Barmuda and Bardeaux. Despite its name, meat is not the main focus, nor is Botswana, although you can order steaks (of local beef, salmon or tuna) by weight with a choice of sauces. The more interesting dishes explore seasonal, local produce, and include South Island sole, West Coast whitebait, pulled-lamb soft tacos, local wild rabbit and salmon gravlax. Banquette menus offer a good range of options. The drinks list is extensive (it includes 16 beers and three sections of cocktails) and has a strong local focus. The lunch menu offers a lot of tasty $NZ15 options, and only the charcuterie platter for two breaks the $NZ30 barrier.